There are hundreds of peony cultivars available in commerce, in spite of the fact that many garden centres carry only a few token ones in the basic red, pink and white. The most commonly grown peonies on the prairies are those descended from the Chinese Peony, Paeonia lactiflora. Improvements have been bred in various temperate countries, including England, France and the United States and Japan. Only a few developed in Canada have found their way into commerce. In the past decade, a number of peonies bred in China and New Zealand have found their to North America, and their numbers are increasing yearly. Only time will tell if they are significant improvements or not. These peonies are categorized according to flower form: 1) Single - with one or two rows of petals and a centre of stamens 2) Semi-Double - with three or more rows of petals (rarely less) and with a centre of stamens 3) Japanese & Anemone - the two are distinct, but usually lumped together by most authors - with a centre of stamens which are partially transformed into petals. 4) Double - fully double with many petals and often showing no stamens, or with hidden ones sometimes showing as the flower ages. This includes the bomb and rose forms. Hybrid peonies are those resulting from crosses between two distinct species. Many are hybrids with little known species from Europe. The colors can be much more vibrant than non-hybrids. They are often hard to propagate and many remain elusive or expensive, with few being propagated in the prairie region. They can be classified by flower form as well, but the majority are single or semi-double. HYBRID INTERSECIONAL (ITOH HYBRIDS) These are crosses between herbaceous peonies and tree peonies. They grow like herbaceous peonies, dying to ground each fall. Bartzella, Garden Treasure, both yellow, have done well in Saskatchewan. Julia Rose has also done well, and many others are worth considering. Unfortunately they are very expensive and offered by only a few nurseries. It is best to buy these potted or direct from a peony nursery specialist. Losses have been reported when snow cover was absent, so a fall mulch is desirable for them. Check the Canadian Peony Society website for a list of peony sources in Canada. TREE PEONIES The name tree peony is a misnomer, for they are really shrubs. With care, some of them can be grown in the Regina area. They do best when given some winter protection - the more the better if you want profuse bloom. Lutea hybrids (often in various shades of yellow) may be better choices. Some Japanese tree peonies have been grown in the Regina area, but as a whole, the successful cultivars are not well documented. It may be necessary to winter some wood in order for Japanese tree peonies to bloom, whereas Lutea hybrids sometimes bloom on new wood when the old wood is lost. Fibreglass bats can be used to protect the stems; dried leaves are a second choice. High Noon, Age of Gold and Amber Moon are three lutea hybrids that have performed well in this area, given winter protection. 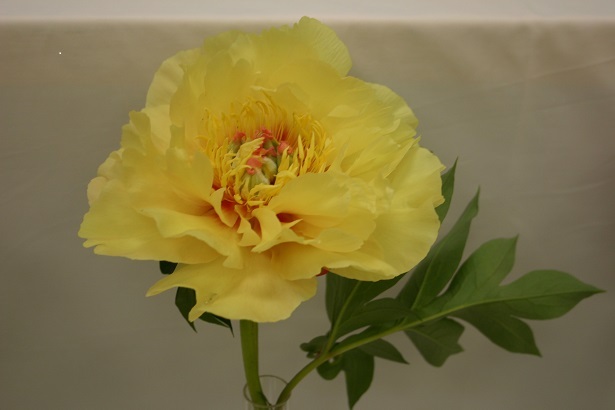 Yachiyo Tsubaki is a Japanese Tree peony that has bloomed in Regina; others are on trial. Paeonia rockii (P. suffruticosa var rockii) is also recommended and may be the hardiest of all. The ideal time to plant bare-root peonies is in September. Mail-order companies take orders well in advance, some as early as January or February.